10.1 GlassFish V3 integration module. Default layout of windowing system has changed a bit. Tasks window is now visible by default. Debugger windows, Output window, Tasks window and other windows which show up in the same place as Output have changed their position. For more details see the UI Spec document. Main menu changes touched Build, Run and Debug menus. Main Project concept and its relationship to project-related actions has been modified to suite well both groups of users - those who want to use Main Project concept and those who don't. Categories in New Project wizard are now named and ordered according to a new 6.5 UI Spec to better distinguish the technologies (Java, PHP, Ruby, C/C++, ...).
. It is possible to install the IDE to UNC like folder and also it is possible to create projects and other resources on UNC paths. A new panel in options dialog which allows to say to NetBeans that files with certain extension should be treated as files with a certain MIME type (see #133773). You can add a new extension to the list of modify existing one. If you want to restore default setting for selected extension, you just click the Default button. In connection with the above change there was also added a new Open As... action. It is enabled only for files which are not recognized by the IDE. User can choose one from supplied MIME types and from now on all files with this extension are treated as of choosen MIME type. Certain IDE distributions (e.g. PHP IDE) don't require Java JDK to run on, JRE is enough. Plugin Manager now checks OpenIDE-Module-Package-Dependencies of all modules which user selects to be installed. If the user's IDE is running on JRE and the unsatified package dependency might indicate that JDK is required, user is warned about it and the plugin installation is not allowed. Quickly search for action or type is now easy. Use Ctrl-I. This is not only an end-user feature, but also offers an API. 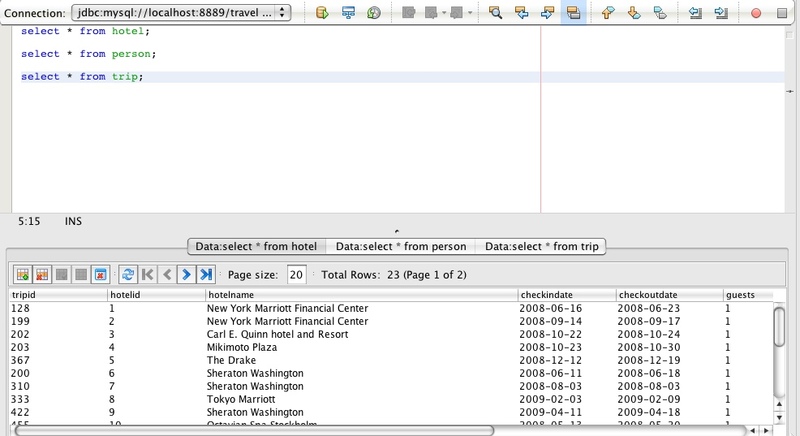 Its SearchProviders can easily become part of every NetBeans module. A wizard supplying easy generation of providers will become part of M2. Since NetBeans 6.1 it is possible to control whether JAR/Folder added to project classpath is referenced via absolute or relative path. Now it is also possible to define a global IDE named variable pointing to a folder and use this variable as a base for referring to JARs/Folders. a named IDE variable can be used. Just browse for your JAR/Folder and if selected file is under a variable the option gets enabled. Alternatively press "..." button and setup a new variable. The Eclipse project import feature facilitates mixed IDE development teams. It allows you to select Eclipse projects from an Eclipse workspace and generate NetBeans projects for them. The generated NetBeans project keeps a link to the original Eclipse project and will update itself after any relevant change: for example, changing the classpath of the Eclipse project. The update is done automatically when the NetBeans project is opened, or can be explicitly requested via a context menu item "Synch with Eclipse" on the project. Support for creating applets that can be deployed via Java Web Start was added to NetBeans IDE. Note: the functionality is available in JDK 1.6.0 update 10. Each application or applet deployed via Java Web Start can specify external resources (usually other JNLP file in internet). Dialog is opened by clicking on 'External Resources' button. Each applet can have number of properties defined in JNLP file, those properties can be defined in dialog that is opened by clicking 'Applet Parameters'. Also you can set applet dimensions in the dialog. See the NetBeans Feature page for JavaFX 1.0. Quick Search functionality introduced in 6.5 M1 is not only end-user functionality, but also an API which allows modules to register their own providers for QuickSearch. A wizard has been also added in M2 in order to simplify their development. Appropriate layer entries are added, skeleton implementation of SearchProvider can be generated by it. Slided-in windows can keep their preferred size instead of being stretched to the whole height/width of the IDE window. Some window system features can be turned off by branding of core.windows module. OutlineView is a new replacement for buggy TreeTableView. It supports drag and drop, in-place editing of tree cells, enhanced sorting etc. The data model is fully compatible with TreeTableView. API in options.api module has been changed to allow open Options dialog with preselected subcategory (see #109538). In your code you can call OptionsDisplayer.getDefault().open("CategoryID/SubcategoryID"); where CategoryID and SubcategoryID are registration names from layer. For selection a panel under Miscellaneous category use OptionsDisplayer.getDefault().open(OptionsDisplayer.ADVANCED+"/SubcategoryID");. It is possible to drag and drop any text to the Palette window to create a new code snippet. It works for HTML editor palette only at the moment, more document types will follow soon. This feature offers generating of constructor, getters and setters in a PHP class. Read more details here. Now the semantic coloring in PHP editor can mark unused fields and methods. More details about coloring in PHP editor you can find here. Added FTP support for PHP projects - more information can be found here. Added support for specific PHP interpreter per project - more information can be found here. The NetBeans IDE Early Access for PHP was released in April at the same time as NetBeans 6.1. Milestone 1 of NetBeans 6.5 now contains all features introduced in this release. Next, in NB 6.5 M1, PHP features are a part of the "all-in-one" distribution of NetBeans, so they can be used together with all the other NetBeans features. Of course, there is still the slim PHP edition of NetBeans, targeted for PHP development specifically. See below for more features added in NetBeans 6.5 Milestone 1, that were not present in Early Access. Also, to keep up with the new features added to NetBeans PHP support, make sure to check and bookmark the NetBeans PHP Team Blog. The Code Completion functionality evolved a lot since the Early Access Release, mostly due to intensive bug fixing. The new features include support for PHPDoc tags and code completion for elements defined outside of the edited file and the files it explicitly includes. Such elements show up at the end of the list and if chosen the "require" directive is added automatically. Generate code to connect to a MySQL database and to display the data in a database table. These snippets are available under the Generate Code action [[[Alt+Insert | [Alt+Insert]], just like in the Java editor. Available also for PHP development. Right click the item and select "Find Usages" or hit Alt-F7. Css property value code completion is now context aware. You can now easily complete multiple items in one property value which is useful especially for shorthand properties like font or background. Added support for css property values error checking. Completion shows documentation for css properties. Code completion for css property values has been improved. Support for Internet Explorer versions 6 and 7 on Windows XP and Vista operating systems. Requires the presence of active debugging framework. User will be prompted to install it which is freely available. Edit primitive type variable values in Local variables and Watches windows. Stop on exceptions and errors. Requires Firebug 1.1beta. An automatic installation is attempted when not found. Where is the Build action? It is not needed any more. The Compile on Save feature does a build for you automatically. Run/debug/test actions are now available immediately. Modify a method body while running the debugger and save - the changes will be reloaded in the running application. Compilation errors inside a method don't stop you from running your program; if you debug, the debugger will halt if program execution hits that point. Deploy on Change is a feature that instantly redeploys Java EE application when a change is made. For a typical example - a web application - this means not just automatic deployment of JSPs, but classes and descriptors too. The feature is available for web, EJB and EAR applications. Deploy on Save is currently supported for Tomcat, GlassFish V2 and GlassFish V3 (directory based deployment is prerequisite). Navigate | Go To Symbol might be useful. Just type a name of method field or class. Associating Javadoc archive and/or Source archive with a NetBeans Library or a project's JAR was enhanced. Javadoc and/or Sources do not have to be located in archive's root - they can be anywhere within the archive (for example Javadoc is frequently placed in docs/api subfolder) and root will be automatically detected. It is now possible to execute a single test method from the test results window. If a test is interrupted, e.g. by the debugger, the interruption is detected and an appropriate message is displayed in test results. The output pane of the test results window now displays only what the tests really printed out–no extra newlines. This improvement may not work when debugging. More results are displayed if the Ant <junit> task used for execution of tests does not produce any XML report file. In previous releases, no information about passed tests was displayed in such a case. Now, at least basic information (name, passed/failed) about each test is displayed. This improvement may not work when debugging. This plugin provides ability to check and fix Javadoc comments in your source code. Just select project/package/files and invoke "Tools | Analyze Javadoc". Auto comment functionality is back. Show all callers/callees in the search scope of the selected member. Code completion improved. Just write first letters of each word in method to get smart code completion. For instance "iL" stands for invokeLater. Encapsulate Fields Refactoring Improved. New options available. Improved visibility for external schema components. See issue 134861 and issue 122836. Improved sample XML generation from schema. Improved formatting in XML documents. For a complete list of fixes, click here. For the first time NetBeans directly supports Groovy, dynamic language for the Java Platform and Grails, web application framework that leverages the Groovy language. You can mix Groovy with Java in an easiest possible way to take advantage of Groovy dynamic nature in your Java projects, or develop 100% pure Groovy applications. For the web tier, IDE fully supports the Grails framework, including its generators and GSP. Groovy now integrates nicely with Java in Java SE project. You can call Groovy from Java and Java from Groovy. If you want to use pure Groovy project, just create new Java SE project, add Groovy class or script and press Run - that's it. NetBeans understands Grails applications. You can create them or open any existing Grails application without any import. NetBeans doesn't even write any metadata into your Grails application. You can use multiple Grails commands integrated into NetBeans and of course you can run your Grails application directly from NetBeans, including controlling the status of you application from Services window. Code completion has been added to the SQL editor, making it easier to insert schema, table and column names. 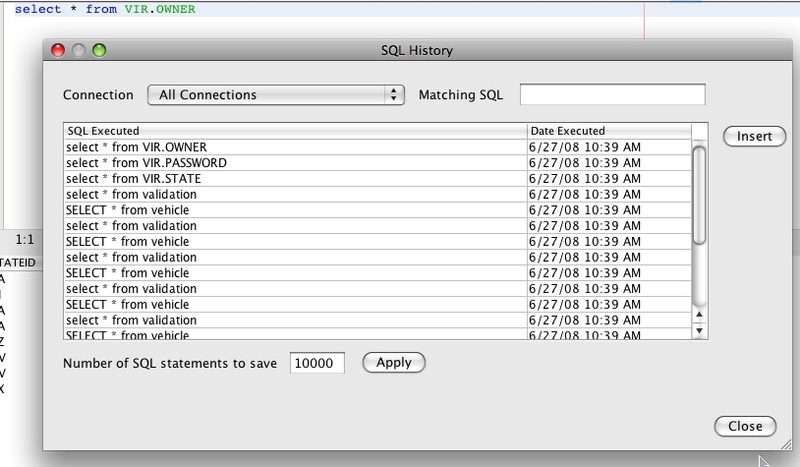 You can now look at the history of all SQL you've executed, filter statements and/or filter by connection URL, and then select and insert a statement. With this you can sort the results by double-clicking on a row header, modify a row, insert and delete rows, there is full pagination support, and you can optionally create a new tab for each statement that returns results, very nifty for comparing results back and forth. Now the dialog for creating a new database connection does not expect you to know the details of the JDBC URL to open a connection. If you want to modify the URL, however, you can do so, just click on the "Show JDBC URL" checkbox. Changes to the URL are reflected in the fields and vice versa. Is now part of the Web & Java EE and Ruby bundles. No need to get the modules from the update center. Refactoring of hibernate mapping files is supported. See Refactoring for more details. The editor support for both JSF Configuration Files and JSF JSP Pages are both improved. The improved features include: Code Completion, Hyperlink, Refactoring, and Find Usage. More details can be found at Editor Support in JSF Configuration Files and JSP Files. Code Completion: On top of the generic JSP editing features, the JSP editor for the JSF page file provides additional code completion for Managed Beans and Resource Bundles. Hyperlink: By using the Hyperlink inside the JSF configuration files and JSF JSP Pages, developers can fast navigate from one source to another reference. Refactoring Support: The refactoring support processes all files in the list of JSF configuration files. Bean and Java class/method usages are found in bean and alias elements and their subelements, as well as elements in the util namespace. Find usages: The JSF support will plug into the Java find usages to show JSF beans definitions which refer to Java elements (classes, methods, fields, properties). The Find Usages action will be available for bean definitions as well, to show beans used by other beans. The JSF CRUD Generator now applies default styles. Collection Type: The collection type used for OneToMany and ManyToMany CMR fields. Can be java.util.Collection, java.util.List or java.util.Set. By default, it is java.util.Collection. Fully Qualified Database Table Names: if checked, catalog and schema attributes will be added on @Table. By default, it is not checked. Attributes for Regenerating Database Tables: if checked, nullable (when it is false), length (for String type), precision and scale (for decimal type) will be added on @Column. Unique constraints will be added on @Table if checked. By default, it is not checked. The panel is at the last step of the wizard. It is optional. New SVG UI Component snippets are available in the SVG Composer. It's now possible to create an SVG-based UI using the SVGComposer. A New SVG Component is available in the Visual Mobile Designer. Now it is possible to create an SVG UI using the SVGComposer then drag and drop an existing SVG file on to an SVGForm component. The necessary code and SVG Components from SVG file are then added to the SVGForm component. New property editor that is part of the SVGForm allows you to look up the contents of an SVG UI file. It shows an SVG UI preview as well as components and its assigned ID. Mobile Screen Designer shows a preview of the SVG UI and provides an easy way to switch back to the SVG Composer by choosing the "Edit SVG" action from the pop up menu. Improved Data Binding custom property editor. The ProGuard library was upgraded to version 4.2 and JMUnit to version 1.1.0. Mobility Data binding provides a simple and consistent way for applications to present and interact with data in the Visual Designer. It utilizes the Databinding libraries available in Netbeans Mobility. New custom component DataSet which provides data for UI components. Custom Component Support helps to create the Visual Mobile Designer Custom Components. It generates all of the necessary Custom Component infrastructure including: Module project Infrastructure, components descriptors and producers as well the layer.xml file. New Project Custom Component wizard. Generated project and classes with one component descriptor and one producer. Add Mobile Custom Component wizard. Motivation is to extend group of existing SVG components to provide better support for creation of compelling UI on mobile platforms using SVG technology. Step Into action (F7) now offers an easy selection of the method call where to step into if there are more possibilities at the current line. Simple ui mode is invoked. The desired call can be chosen by arrow keys or by mouse directly in the source editor. A heuristics is used to determine the method call offered by default. In the example below you can select between <tt>setText</tt> and <tt>getString</tt> methods; <tt>setText</tt> is preselected as it is more usual to step into the last method call rather than to parameters' calls. This is a summary description for the new Multithreaded Debugging Support that is available in M1 NB 6.5. These bits have been done as a first phase of the overall NB debugger redesign effort, which goal is to significantly improve the debugging workflow and usability. In order to improve UI for multithreaded debugging and also willing to reduce the number of debugger views, a new (unifying) debugger view is introduced. This view (referred as Debugging View) integrates current Sessions, Threads and Call Stack views being displayed in the Explorer group by default. From the technical perspective, the Debug view is organized as (in general) a list of sessions, having each session as a list of threads, each suspended thread than expandable to its call stack and more. Debug view is customizable via context options only showing typically needed info by default. With the 'Suspend Table' switched on, any thread can be resumed/suspended by one click on the dedicated button. If there is the debugger counter displayed in the editor and another thread encounters a breakpoint, the current thread will not be automatically switched. Instead, a non-modal panel is displayed in the bottom of Debugging view informing that there are new breakpoint hits waiting; there is also a drop-down button switching the debugger to the next (or selected) breakpoint hit. Having this non-modal notification, users are allowed to finish their debugging of current thread (e.g. expression evaluation) and switch to next breakpoint hit when it fits to the workflow. When doing a multithreaded debugging, it is often needed to quickly switch between particular threads; e.g. when doing a stepping sequence in two threads alternately. For such purpose we introduce a new action--Current Thread Chooser (CTRL+8). In fact, it is an analogy to application switching common in OS environment. With this feature, it is really straightforward to revisit any thread for debugging or switch to a particular thread for the first time. Anytime the debugger displays the thread icon in the editor gutter, the user is informed that there is/are one or more suspended non-current thread(s) at this line. The list of these threads can be seen in the icon tooltip, and it is also possible to switch debugging to any of these threads via the context menu. Strictly speeking, it is the Source->Threads navigation available in the editor gutter. The debugger automatically searches for deadlock among all suspended threads. When a deadlock is detected, a non-modal notification is displayed having emphasized involved threads. Detailed monitor info is also available displayed in dedicated monitor nodes. In order to improve multithreaded debugging, we decided to change the way how debugger manages debuggee threads. The main issue related to current model (NB 6.1 and older) is likely the fact that any step resumes all threads regardless there are threads intentionally suspended by the user or not. This can be limiting e.g. in case of debugging race conditions or deadlock issues. The natural solution to this problem is to resume only the current thread leaving other threads suspended if they are (may have happened via breakpoints or Suspend action). Obviously, this change needs the default breakpoint to suspend only the breakpoint thread, otherwise stepping could lead to so-called Deadlock Caused by Debugger. Default breakpoint suspends all threads. Step resumes all threads when invoked and suspends all threads when completed regardless there are threads intentionally suspended or not. Evaluation is done only resuming the current thread (by default), which may easily lead to 'deadlock caused by debugger' in current model. 'Step interrupted by a breakpoint' issue exists with default breakpoint. Default breakpoint only suspends breakpoint thread. Step only resumes current thread when invoked and suspends current thread when completed. Evaluation is done resuming the current thread (other threads unsuspended by default breakpoint or step). No deadlock caused by debugger might happen as far as no thread is explicitly suspended by the user (via suspend action or some breakpoint). Usually the users of GUI builder don't need to care about the generated code, but there are some situations where it is desirable to have the generated code as simple as possible. Beginners sometimes look into the generated code to learn how some features are implemented. Experts on the other hand should be able to find places for their tweaks quickly. While we always tried to generate the code that resembles the one written by humans there was always one area where we failed. We always generated code with fully qualified names e.g. javax.swing.JButton instead of JButton. Since NetBeans 6.5 Milestone 2 the GUI builder has an option to generate simple class names. In fact, there are two options. You can find the first one (called Generate Full Classnames) in the Properties of the root node of Inspector window. It determines whether simple or fully-qualified names should be generated for the opened form. The second option (e.g. the global one) is in Tools > Options > Miscellaneous > GUI Builder. It determines the default value of the per-form option. The global option is used when a new form is created only. Changes of this option doesn't have any effect on the forms that already exist. Note that the generation of simple names can take few seconds for bigger forms. That's why it is switched off by default. If you feel slowed down by the slow generation of simple names, you can always switch it off while editing the form and then switch it on when you are finished with your changes. When you select a ButtonGroup or some component in a ButtonGroup then the GUI builder shows you which components belong into this group. If you use JDK 6 Update 10 then you can preview your form in the new Nimbus look and feel. We have made this preview more reliable and accurate (within the limits of <tt>javax.swing.UIManager</tt> design). Besides the design preview you can also set the Nimbus look and feel for runtime - this is easily possible for Desktop Java Application projects in the Project Properties window (go to the Desktop App panel). New TreeModel property editor allows you to prototype your JTree easily. We rewrote property editors for ListModel and ComboBoxModel. It is much easier to use them by now. A new wizard allows for the creation of RESTful, JSR311-based services directly from database tables. This facility is in addition to the wizard that creates services from JPA entities. Web Services nodes in the Services tab of Netbeans 6.5 support Drag-n-drop to Php files as shown below. Code completion accuracy has improved from milestone 1 to milestone 2. For a range of mid to large scale applications, those cases where valid choices are not shown are now around 3%. Error highlighting in the Source Editor includes missing semicolons and unresolved identifiers. Occasionally false errors are reported: 3-5% of identifiers highlighted as unresolved are actually correct. The memory window displays the contents of memory addresses currently used by the project being debugged. You can define remote hosts and use development tools on those hosts to build and run projects from your client system. You can package completed applications as tar files, zip files, or SVR4 packages. Show all callers/callees of the selected function. C/C++ editors highlights basic errors. Semantic highlighting for typedefs, class fields and function names was added. Hibernate is now part of the standard distribution. No need to install the plug-in anymore. Support for J2SE projects apart from Web and Maven projects. Improved Modularity and Ease of Customization. General JPA controller logic has been moved into separate classes that can be generated from a new wizard, namely, File > New File > Persistence > JPA Controller Classes from Entity Classes, enabling non-JSF applications to use such logic. Likewise, other general purpose logic has been moved from the JSF Controller classes into utility classes. Also, in order to support iterative development with a changing database schema, per-property code has been removed from the generated JSF controller classes by means of a new ELResolver. Consequently, if your add or remove columns from your database schema after customizing the JSF controller classes, you do not have to regenerate the JSF controller classes and migrate your customizations. The NetBeans UML Plugin underwent a complete rewrite of the diagram drawing area for the NetBeans 6.5 release with approximately 50% of the code being rewritten. UML now uses the NetBeans Visual Library making it completely open source. The main modeling palette was simplified and context palettes were added, enabling easy and rapid creation of modeling nodes and relationships. Please see UML Current Projects for additional information. In the left pane, select the UML plugin and click Install. Hint, type uml into the Search box to quickly locate the UML plugin. Activity, Class, Sequence, State, and Use Case diagrams are supported. Collaboration, component, and deployment diagrams are not planned for the 6.5 release. The modeling palette has been simplified for 6.5. The nodes have been retained while the edges and a few strategic actions have been moved to context palettes. We also updated our palette gestures to align with the form editor palette, i.e. drag and drop, click and click, and shift-click for multiple drop. Relationships have been moved to context palettes for each node type making the actions much easier to find and access. In addition, dragging a relationship to whitespace on the diagram automatically creates a new node based the context. Remote profiling packs are now generated from the Attach Wizard and don't need to be downloaded separately. Table view has been added to threads monitor. Subversion client 1.5 for Windows is available on the Update Center. The IDE is able to download and install it automatically when Subversion is to be used first time in the IDE. So the IDE does not need Subversion installed on the system. NCLEX PN test - "How You Can Push The Accelerator To 'Crack-The-Code' Of Your NCLEX-PN Test In 7 Days And Go To $37,857.00 In Practical Nurse Salary Right Now...Or Your Instant, 100% Money Back"